In early January I wrote about French SNEB 68mm rockets that had been shown on Syrian State TV and filmed being used with various DIY launchers. 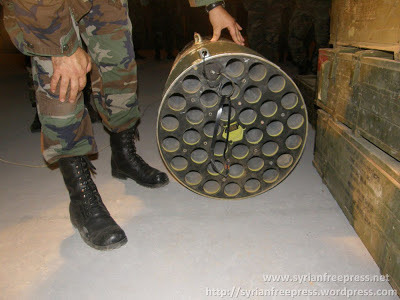 As I pointed out, these types of rockets had a history of being used in the Libyan conflict, and were part of a shipment of arms from Libya destined for Syria stopped by the Lebanese authorities. 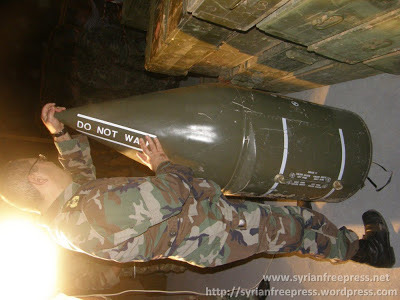 What we have here is a French MATRA rocket pod, designed to fire 68mm SNEB rockets, with this photograph from AFP appearing to show another example of the same type of rocket pod. Examples of this same type of rocket pod mounted on vehicles in Libya can be seen here, and here in a very informative post about the SNEB rockets in Libya. The Syrian air force does have a small number of French SA-342 Gazelle helicopters, but as yet the opposition has not overrun any of the locations where these are based, nor has their been footage of these types of rocket launchers being captured by the opposition, so it leaves open the possibility that these are part of one of the rumoured cargoes from Libya that made it into opposition hands. To speak the truth this is a nice post concerning this topic. I got a pure solution from here. Also I can refer to you all bestcustomessay.org/essays here to get educational helps. Nevertheless will wait for more posts from the blogger. Thanks a lot……. The aim of the policy is to create certain learning remains a joy for his or her students, not a second shift dissertation writers of labor that impedes social time and inventive activity. This is my first time i visit here. I found so numerous entertaining stuff in your blog, particularly its consideration. From the tons of remarks on your items, best essay writing service I estimate I am not the only one having all the leisure here! Keep up the good work. Banner conceive thkx. The website is very cooperative in a sense of delivering advisory on different matters. dissertation editors individuals do get very much significance by using the advisory here. I got an unadulterated response from here. To converse the truth this is a pleasant post pertaining to this theme. furthermore I can overtake on to you all here to obtain instructive assists. although, I will delay for more mails from the blogger.……credit card processing..